My mother-in-law is one of a kind! Who else goes to yard sales to not only look for things for themselves, but to look for any sports stuff for their son-in-law as well. Most of the time she goes for cards, this time something else caught her attention. 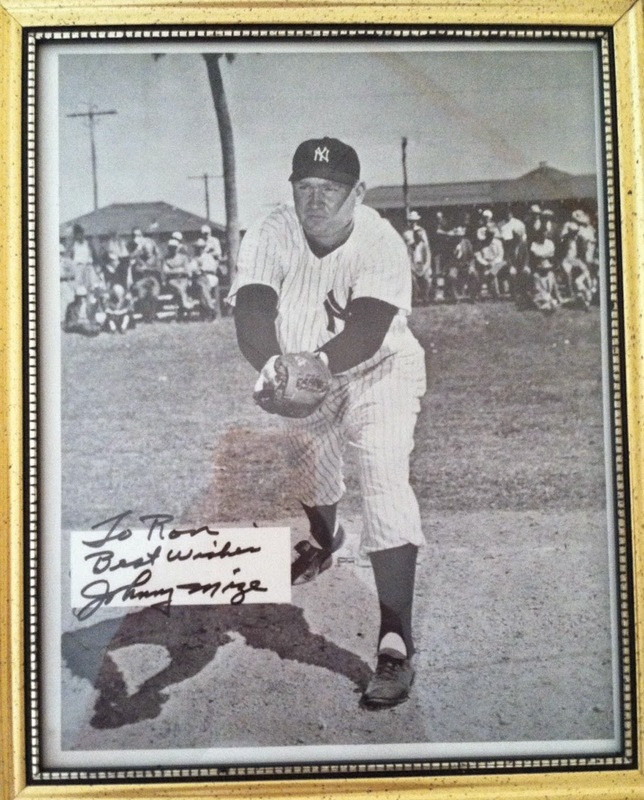 Yesterday, she brought this signed pic of HOFer Johnny Mize to me knowing I am a Yankees fan and I collect signed items and said she picked it up for $10. 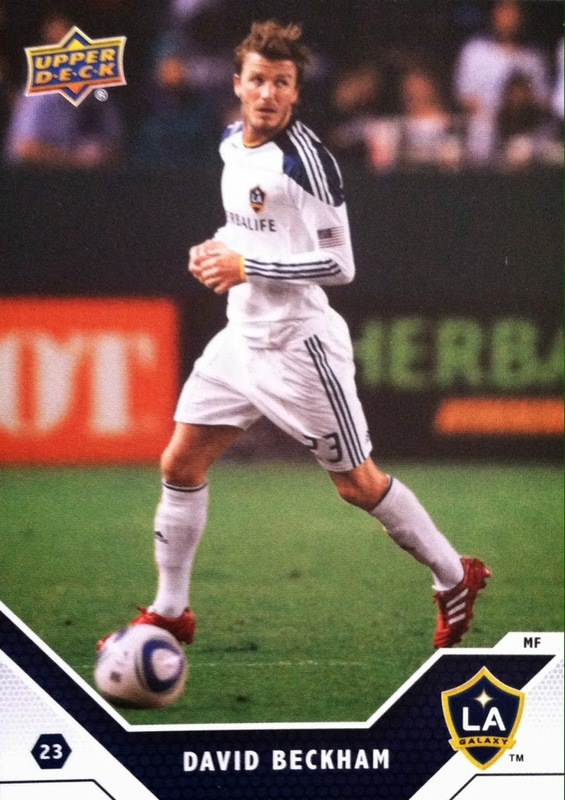 I thought that was a great deal for such a nice pic, signature and the fact he is a HOFer. Another thing I like about this item is the inscription. I don't on any pieces of memorabilia with one on it. So it sort of adds another personal touch and extra signature to the photo. I just wished my name was Ron lol. Either way it will look good in the man cave. Let me know your thoughts on this piece and what pieces you have found at yard sales. 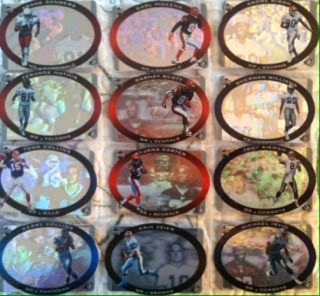 You Might Be A Card Collector If.......you hear, "this is possibly the greatest INNOVATION of all-time!" 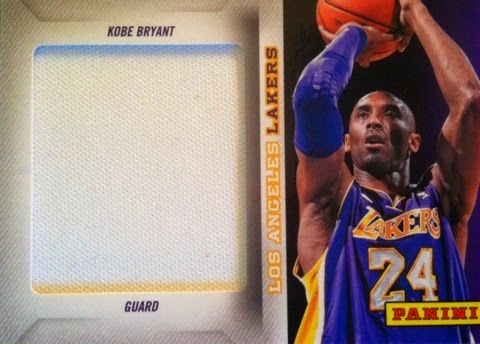 Then go to check it out only to be disappointed not to find a basketball card box from Panini America. Yesterday, I received this card in the mail that I knew would be arriving soon and one I really wanted to add to my PC. Growing up in the 90's, I was HUGE Knicks fan. I would watch them every time when they played on NBC (didn't have cable back then) that I could. To me, basketball in the 90's was just as important as Saturday Morning cartoons. One of my favorite players, other than John Starks, was Patrick Ewing. Loved watching him play and loved seeing when he posted-up. What a player! 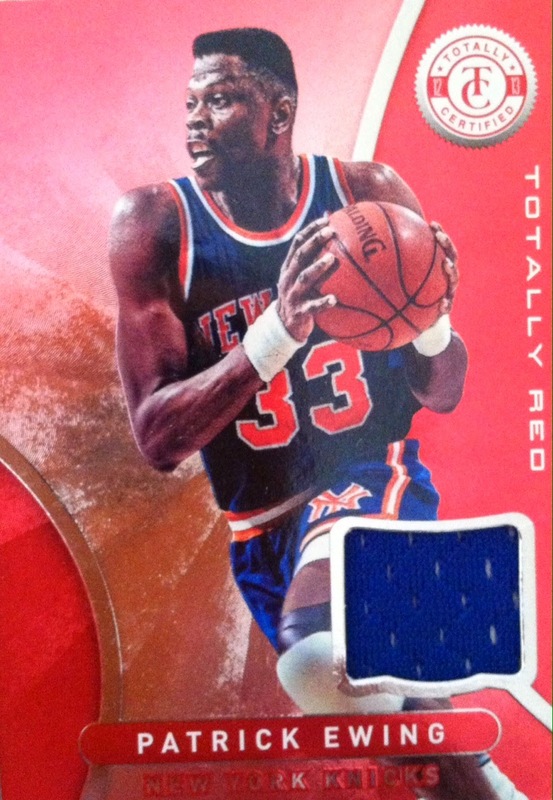 Adding this card of Ewing yesterday marks it as my first memorabilia card of him and I owe a big thanks to Michael Mcmannis, ‏@JGfan24ever on Twitter, for the contest and card. 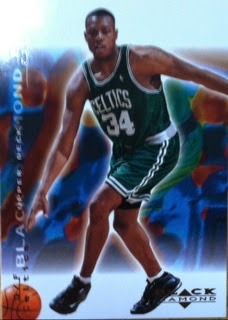 This will forever be in my PC and bring back those nostalgic moments of watching basketball in the 90's. Thanks again Michael and if you are not following him yet on Twitter, please do so. He not only does giveaways like this all of the time, but he is a great guy as well. 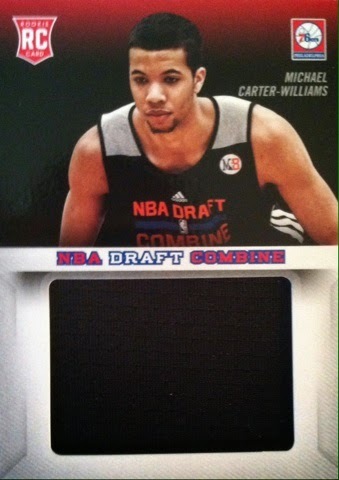 Labels: 2014, Michael McMannis, patrick ewing, What's In The Mail Box? 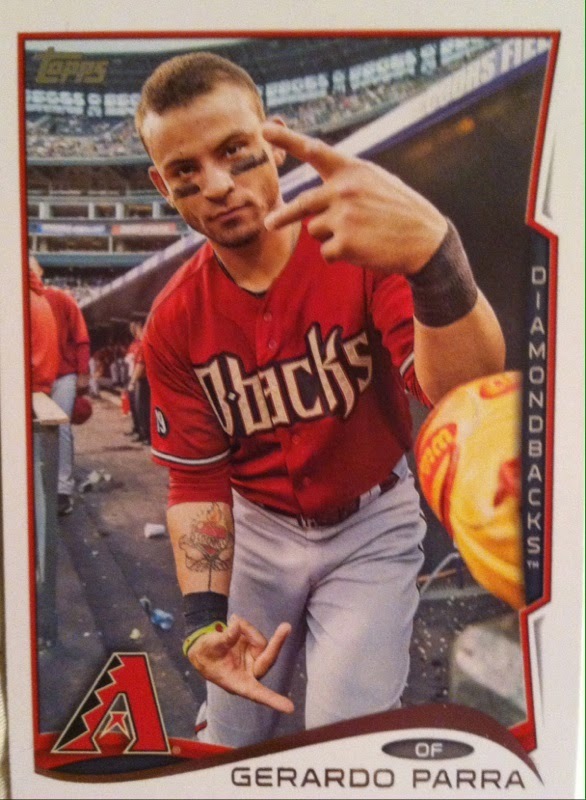 With every new baseball card release I try to pick some up especially when there are some good rookies to chase after. 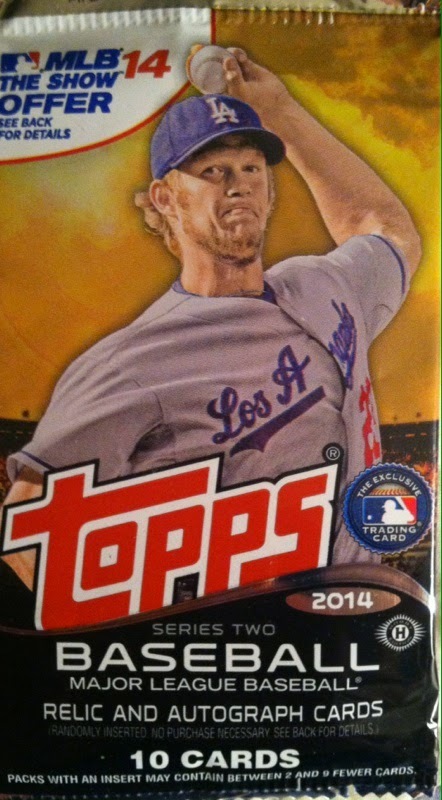 With the recent release of Topps Series 2 baseball I was at an LCS on vacation so figured, hey, why not. 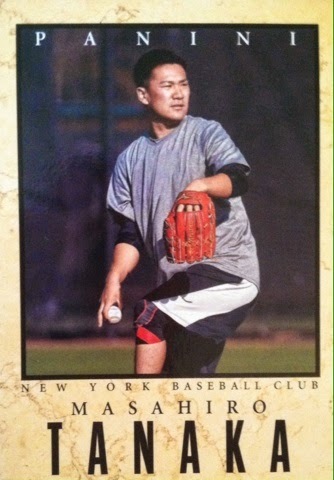 My main goal in the product was to find rookie cards of Tanaka and Abreu. 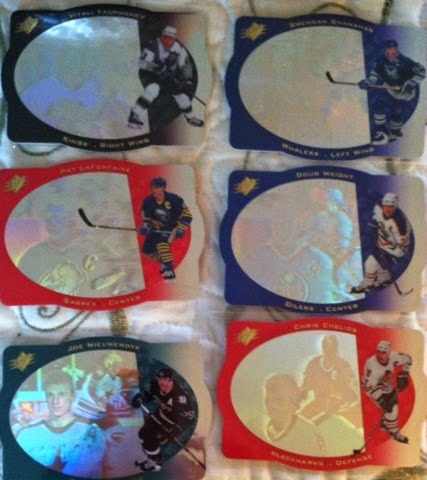 Though my six packs didn't provide me those, I did get a few other pretty cool cards instead. Now onto the break. As always with my Hobby or Retail Break 'Em's I show off all of my "hits" along with a pic of a base, rookie and subset card if there. Good rookie pickup in Beckham. Maybe next time on Abreu and Tanaka. 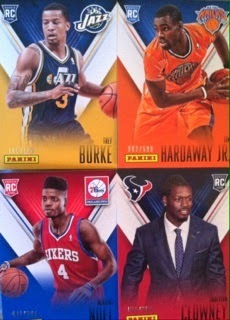 I also pulled two inserts in this pic as well including only my third Power Player. I haven't been too fortunate with those yet. And finally a 75th anniversary buyback that falls 1:18 packs where Topps takes an original card and stamps it with Topps 75. Overall, I felt good about this break. 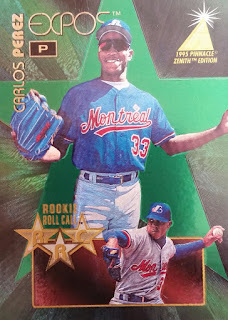 I wished I could have gotten the rookies I wanted but I did get a few decent insert pulls and I found the buyback card was pretty cool despite not being a big player pull. Recently on Twitter, BCW Supplies posted a pic of something I knew I could really use and I knew many other collectors could use too. If you are like me and collect a lot of sports cards and store most of them, sets, commons, inserts, etc in 300-800 ct white boxes and they seem to be lying around everywhere in your house..well...BCW has a solution for you! It's called the BCW SHOE HOUSE WITH 6 SHOE BOXES. I received this new product in yesterday and went right to putting it together. The box didn't have instructions on how to put these together, but it was pretty self explanatory when you looked at them. I am someone who can barely put a nail in the wall straight, but I easily put these together. But I will quickly give you a sum-up on how to put them together. Start with the middle section and fold it into itself so that the white is showing upwards. This will make more sense once you see it. The cover, you fold in the longer sides and seal them in with the shorter ones. Like I said, this was pretty easy to do but don't be ashamed to ask for help. If you do buy this and cannot figure it out, please feel free to contact me with questions at sportcardcollectors@hotmail.com. 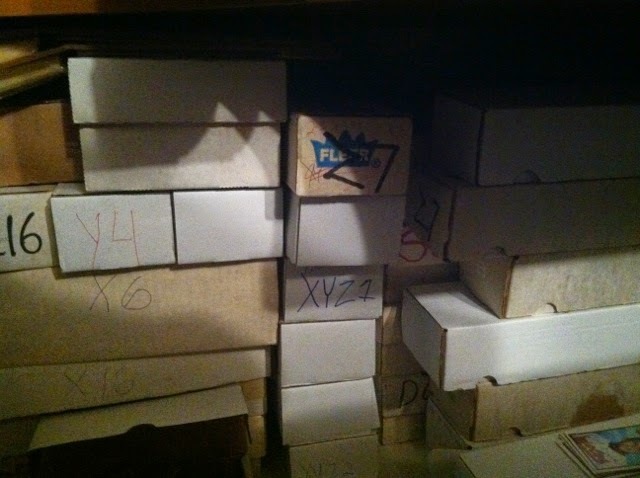 Each box holds around 1600 cards and the total Shoe House can hold up to 9600 with all 6 boxes. The cards you can fit in here can range from base cards, cards in toploaders and cards in one-touches. 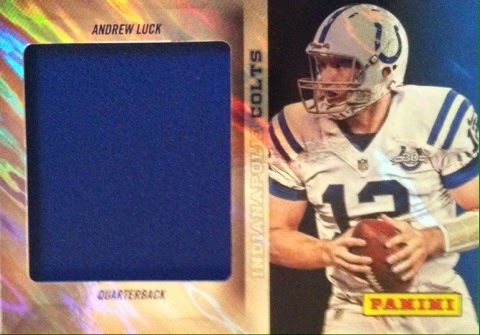 I tried to fit a graded card in here but was a little too wide. "Fold the outside box, overlapping the flaps on the bottom. Tape is recommended." "Fold the 3 inner pieces, folding so the white is out. The small flaps also fold out." "Interlock the 3 inner pieces. Insert the 3 inter pieces with the small flaps to the outside." I than realized I was actually just one step away from completing it. I just needed to fold the inner 3 pieces. Overall looking back on it, I could have done it without the help had I looked a little more. The numbers on my boxes represent what's inside each one..clever huh? Overall, this is going to be a very helpful product containing my card overflow in the man-cave and if you have this problem it will help you as well. 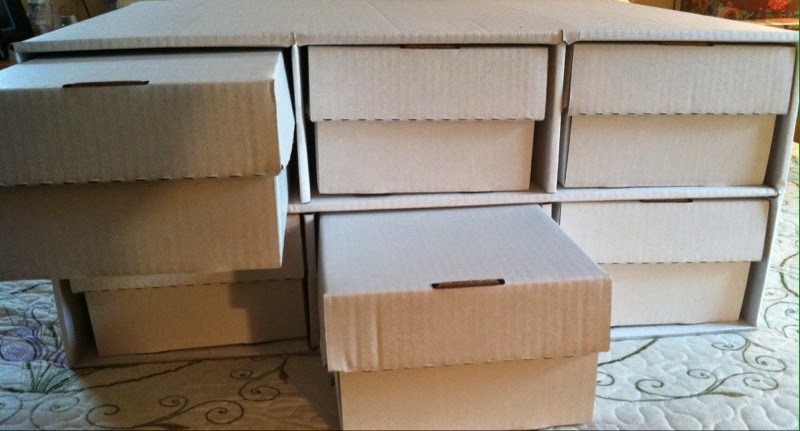 It should house most of the cards I have so I can move out these smaller boxes and slide this nicely organized shoe box house in its place. If you like what you see and will find it useful, I know you do and will, you can locate this item on BCW's website HERE. Let me know your thoughts on this item as well and if you would find it useful. When hearing that the first NFL release would appear while I was on vacation near an LCS, I knew I was going to make a run for it. So my first purchase was for eight packs (the ninth was free) to see how many rookies I could get. 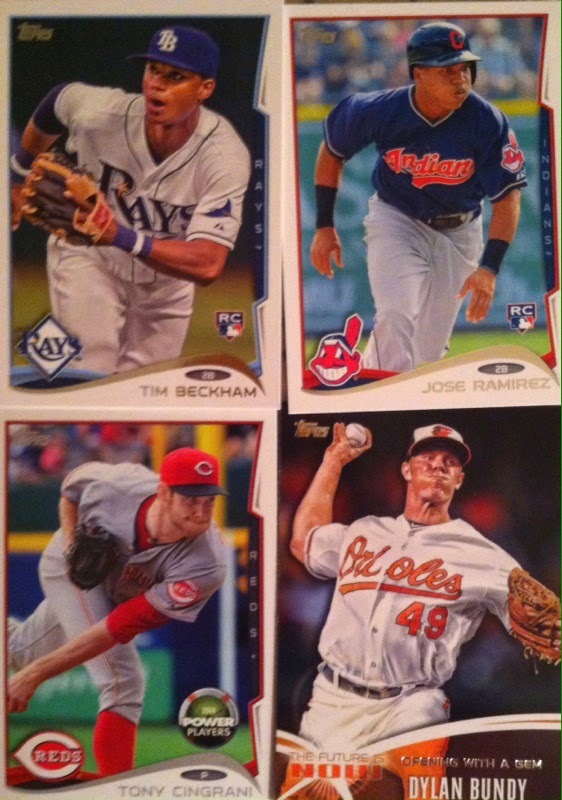 Here are the best cards I got from the break along with some examples of the base cards. I didn't pull an autograph, memorabilia or numbered card but thought I did pretty decent for a nine pack break. 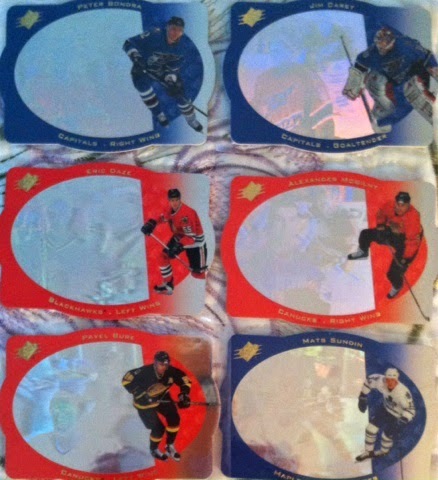 It appears that inserts fall one-per-pack as I got one in every pack. 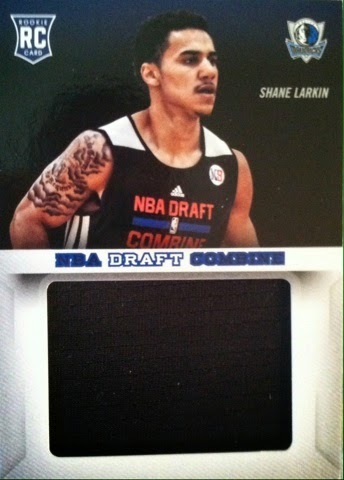 I must say out of those inserts I am a huge fan of the Hot Rookie design! Looks spectacular! 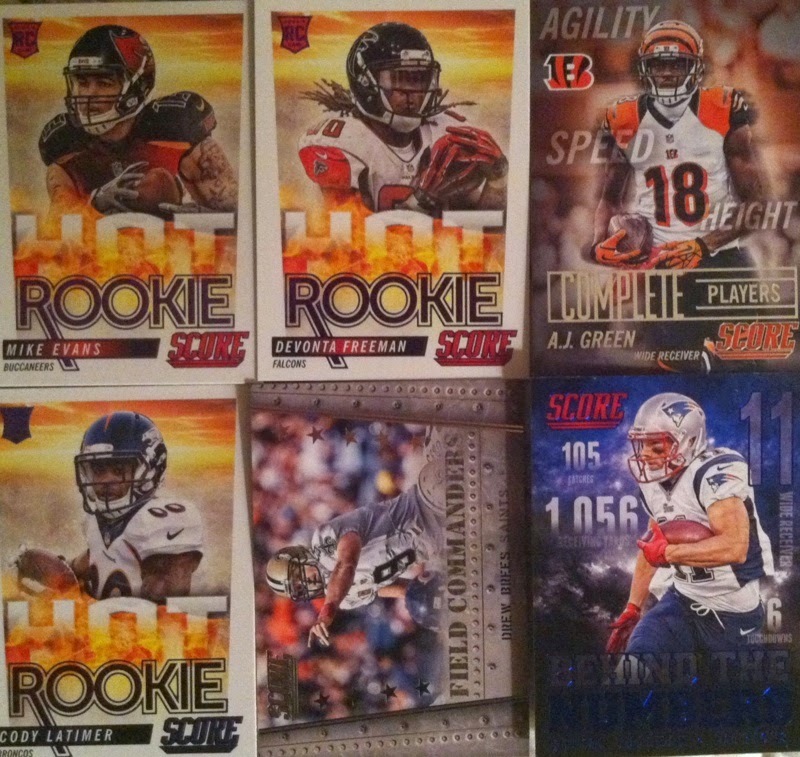 I am also happy to finally have some NFL true rookies of this exciting draft class to put in my PC. 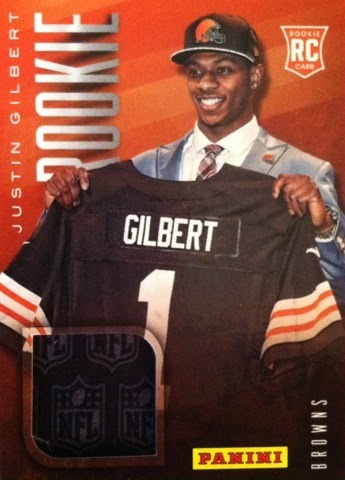 2014 Panini Father's Day 16 Pack Break: 1 WOWZER! If you have been wondering why it has taken me awhile to post these, I have been on vacation away from my computer. Now that I am back, I have gotta share these and couldn't wait to! I ended up getting enough Panini product to land myself 16 packs to open. Last year, I broke about the same and ended up with half of the packs being hits. This time was pretty similar except the only difference was, I hit it big this year. First off, I will show off the base cards I pulled. 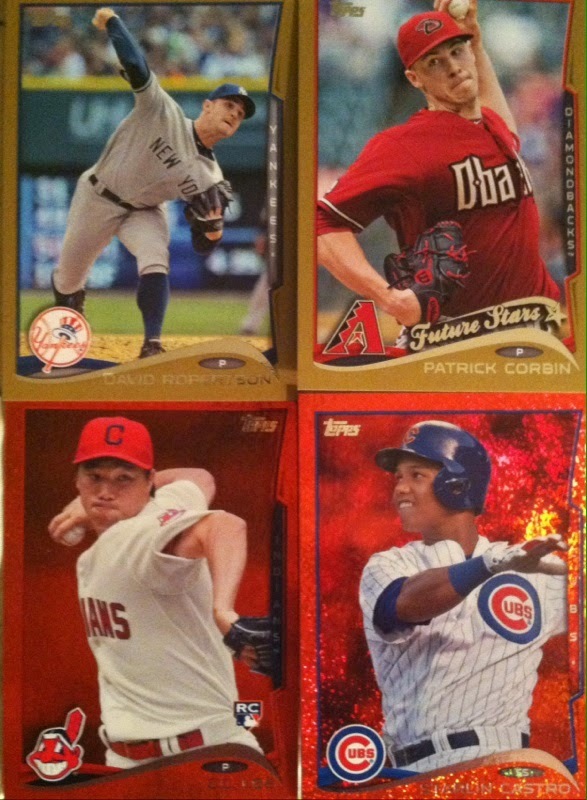 Sweet Tanaka and Abreu rookies! 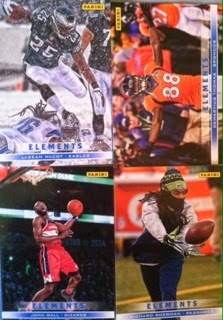 Elements is a pretty cool insert set displaying athletes playing in the "elements". 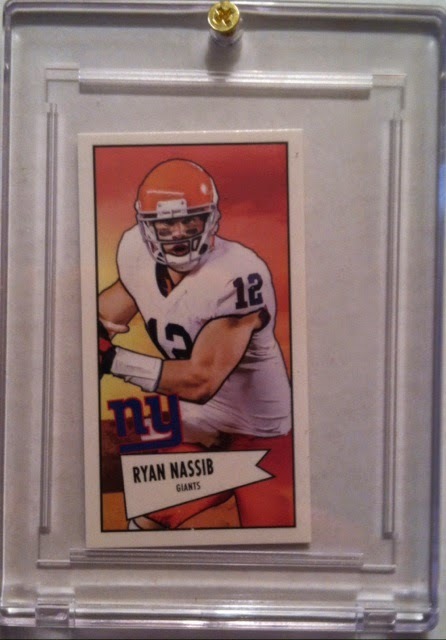 First hit..numbered to 15! 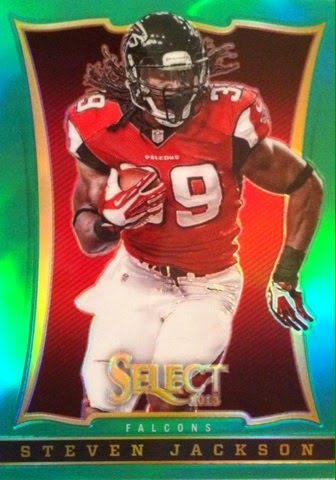 Green 2013 Select parallel! Now onto the rest of the hits including a huge one! Piece of a draft day hat! Pulled from my first pack! Another big hit, Patrick Kane auto 15/15!! And the BIG HIT.......BOOM! 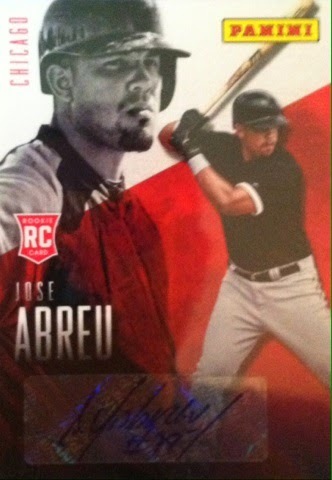 Jose Abreu rookie autograph! I almost fainted! 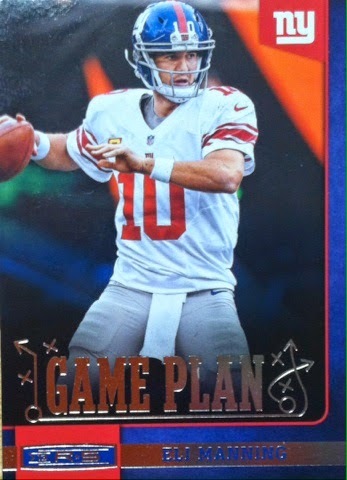 Some amazing stuff in Panini Father's Day packs. I went on vacation four hours away so I could participate. So glad that I did. 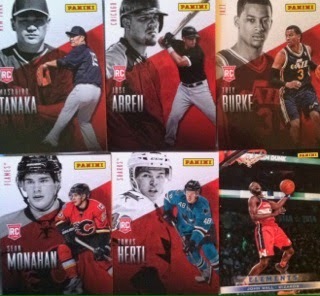 Let me know your thoughts on Panini's Father's Day promo and my pulls from the promotion! 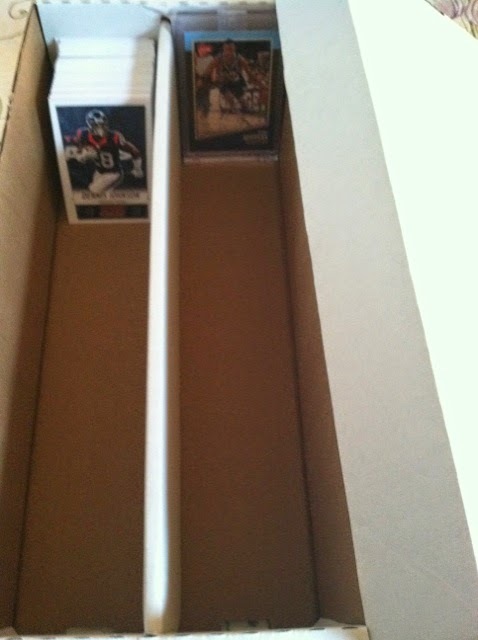 Ever looking for a place to store your valuable Topps and Bowman mini cards? Well, BCW and Pro-Mold have an answer with their Pro-Mold Topps/Bowman mini 1-screw screwdown holder. This is a 2 piece product with a brass screw are individually packaged and made in the USA. They have the following dimensions which work perfectly for the mini cards both in depth interior and outside size. 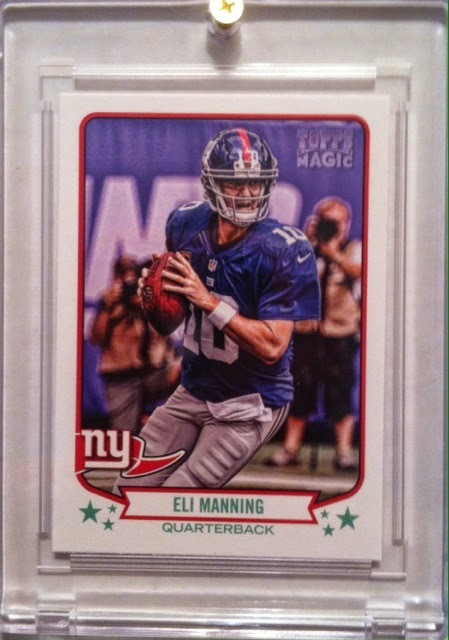 Here is a Topps Magic mini which fits perfectly in the case. The crystal clearness really showcases the card beautifully. This case will also fit the mini's from Bowman baseball as well. 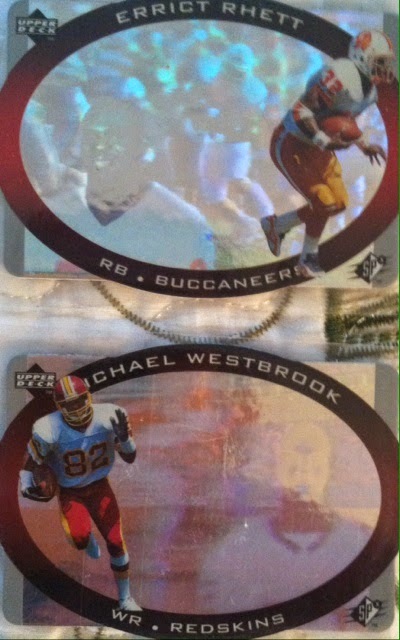 However, they don't fit these size mini's found in Bowman Football and Topps. You will need to find another case for these. These are too small for the grooves and move around. If you have the right sized mini cards like the Topps Magic example I gave above, I recommend using these holders as they are great for these cards in both protecting them and displaying them. 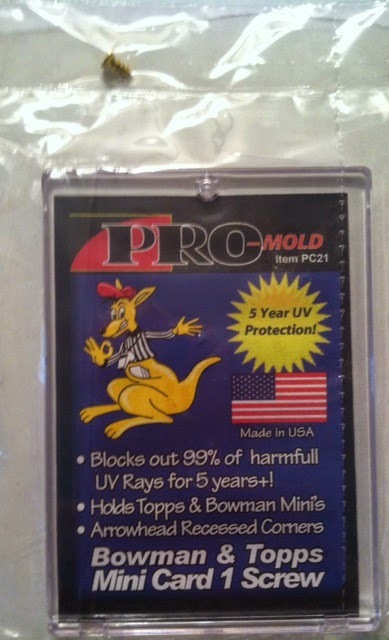 If this is a product you think you will use, you can find these located on BCW's website HERE. That 90's Mail Day: The J.Hoffman Trade Part 3: EPIC AUTOGRAPH! Awhile back I had made a trade with Jonathan Hoffman in which I acquired some pretty sweet stuff, you can find that article right HERE, well, after much delay, now is the time to reveal the final part of it. WOWZA! 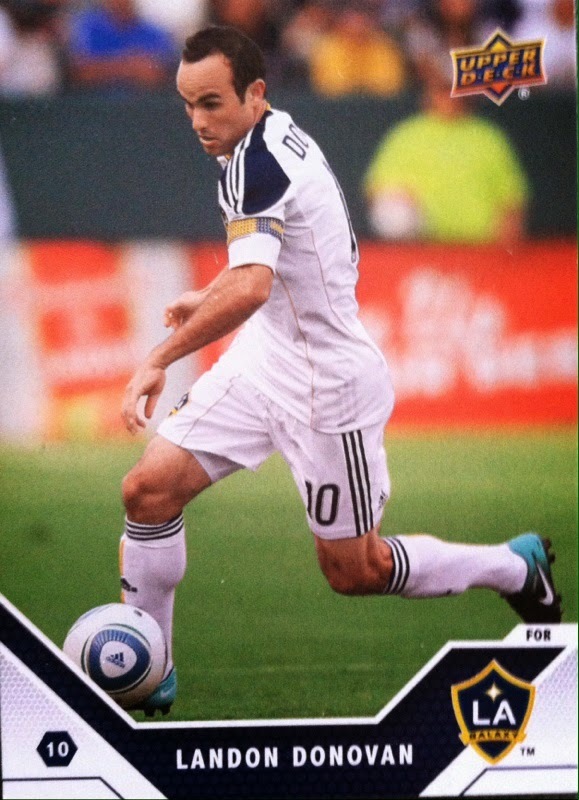 WHAT A CARD!! I can't take my eyes off from it most days. If it wasn't for this huge trade with Jonathan, this dream card never would have been made an reality. Thanks again Jonathan! Now I just need to get myself the autographed Dan Marino one to match! 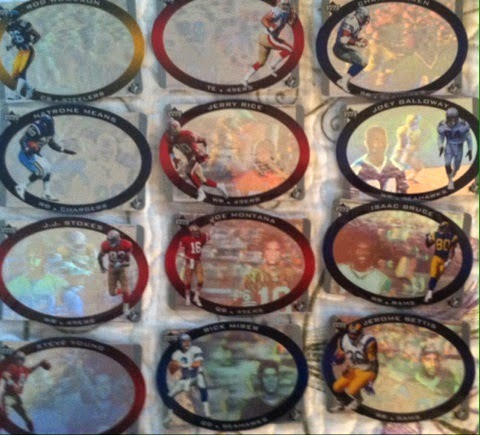 I also may try and get a round-a-bout complete 1996 Spx football collection. 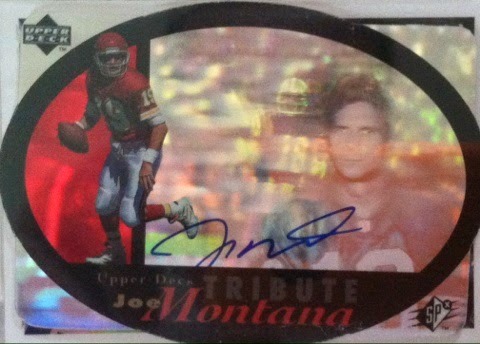 I just need the Joe Montana Tribute insert along with the Dan Marino Record Breaker one and obviously the Marino Auto. 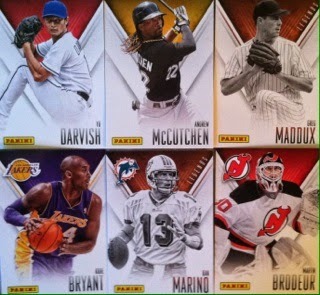 I don't think I will aim for all of the gold parallels or the Holofame Collection but you never know! I plan on keeping you guys updated on my search for my next pieces I want. 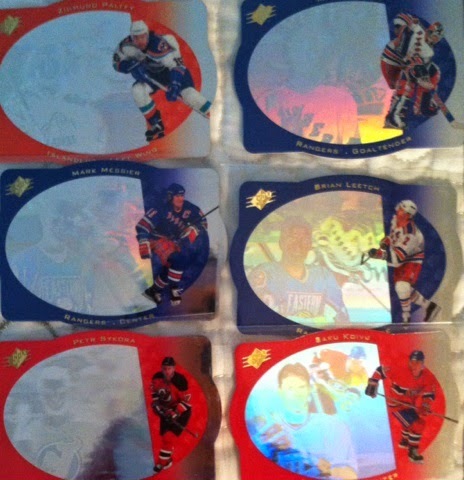 In the meantime, take a minute and comment with your thoughts on this mail day! Awhile back I had made a trade with Jonathan Hoffman in which I acquired some pretty sweet stuff, you can find that article right HERE, well, after much delay, now is the time to reveal the rest of it! 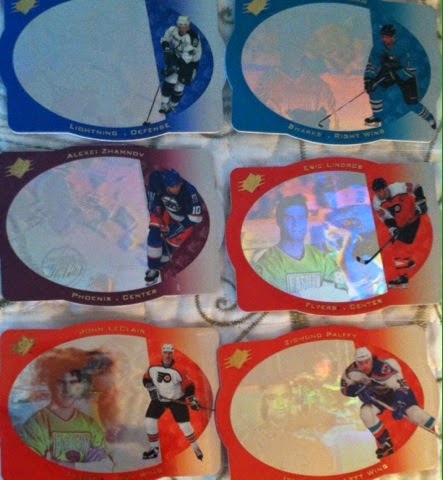 Next up, is roughly a half set of 1996-1997 Spx Hockey. As you can tell by now, I am completely addicted to the design of this product no matter the sport. Check out this gallery below! I must note before you view, that this lot came with 47 cards but there were many doubles and in some cases triples so I thought I would just narrow it down a little. Overall, pretty sweet. Now I just need to find a way to finish the set and you know I will find a way to do so. Well, you have seen two of the hidden parts that I got from this trade but there is still one more to go and I promise you that one is one HUGE BEST CARD IN MY COLLECTION MAIL DAY! It will be well worth the wait! I cannot get enough of it. 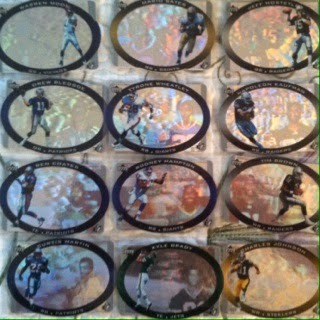 The blend of being a die-cut card, with hologram and a touch of player color just looks amazing. The pictures on this blog don't even come close to doing it justice but I hope you get the idea. If you have seen these in person you will totally get what I am talking about. If you haven't ever seen these in person, I strongly recommend you hitting eBay right now and pick some up! You thoughts on this mail day are welcomed! 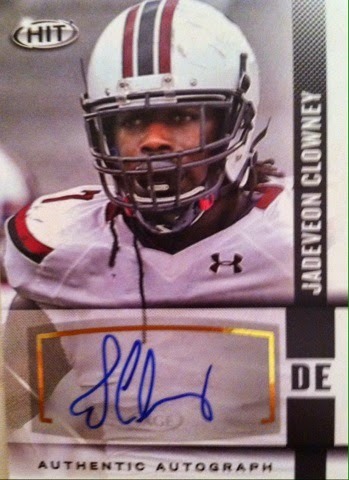 Once again our generous friends over at The Pack Gambler are providing goods for me to host a contest for you guys! This also means a contest that is open to BOTH U.S. AND CANADA residents! Which player had the highest Plus/Minus in the 2013-2014 playoffs that was not in the Finals? I need the player's name, team name and number of Plus/Minus. The contest ends on Monday, June 30th 2014 at 5:00 pm e.t. A RANDOM winner from ALL CORRECT ENTRIES will be announced on Tuesday, July 1st 2014. Good luck and please remember to thank The Pack Gambler for another great contest! You Might Be A Card Collector If.......you take your kids drawings and put them into Ultra Pro sleeves like a collectible. The Hobby: Has It Declined? Having been on vacation this week and actually being able to go to an LCS has made me realize how much I miss the hobby where I live. I than began to wonder, how many of you are in the same situation? About 20 years ago, the hobby was strong where I am. There was a nearby LCS (even another one but it was an hour drive but still within reach), cards in grocery stores, gas stations, craft stores, EVERYWHERE! 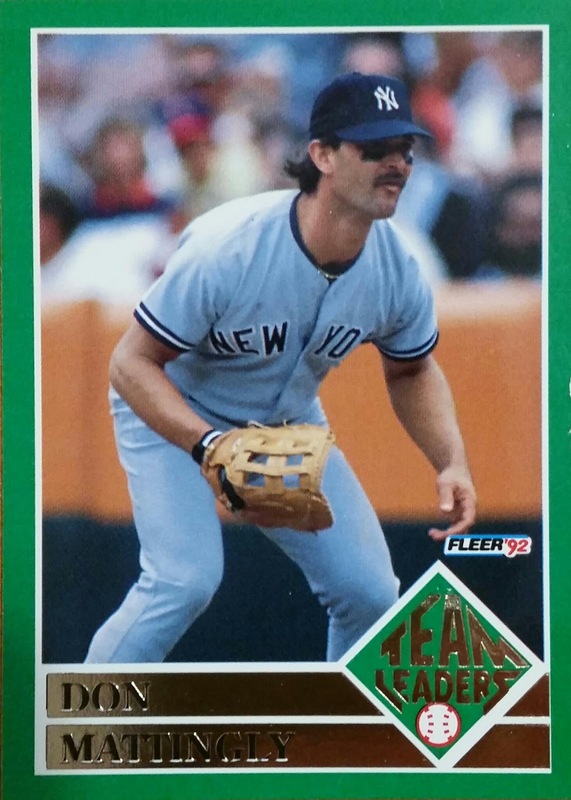 I could walk down the street and trade with other collectors and when I held a yard sale, I could sell my cards to others and discuss the hobby at the same time. There would also be a card show every other weekend where collectors from near and far would gather together and have a good-ole time hanging out together. 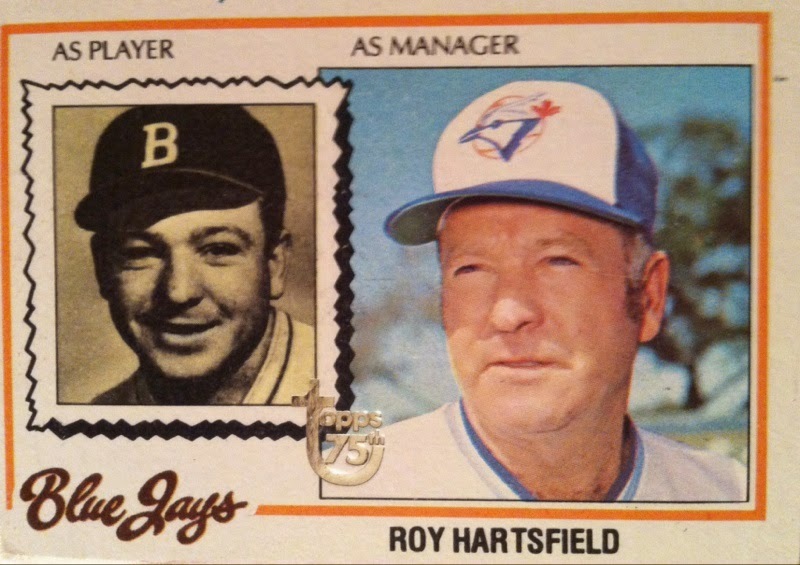 Fast-forward to now, both LCS' went out-of-business, grocery stores, gas stations, craft stores and others no longer carry sports cards. Other collectors nearby are rarer than pulling a 1/1 and selling my cards at a yard sale where I used to be able to sell 25 cards for $1 I can't sell in a diaper size boxed packed for the same price (most I give away to unsuspecting kids who I hope get into collecting). As for card shows, it's been about the 20 years since one has been local. When it comes to collecting where I live, it's tough. The hobby where I live I can definitely say is on the decline and seems to be heading even further that way after seeing the card rack at the only other place besides online that I can buy cards from,Walmart. They narrowed what used to be a huge card section down to 6 different blaster boxes and about 8 different rack/jumbo pack options. It truly makes me sad to see this for a couple reasons as I won't be able to buy when I have a chance and that also means others won't either who may be trying to get into the hobby or continue on. It seems they are driving the hobby out of the store and trying to get rid of one more spot in my area. With the above stated, this is why I started blogging and expanding how I collect by using social media. I want to be able to reach other collectors and discuss the hobby. I am glad to have found many outlets to discuss such as Twitter, Facebook, blogs, and forums. As for my purchases, I do them online or do take the occasional whatever Walmart offers approach. I can't fix not having a card show and for the most part I don't sell my cards except my doubles so if they don't sell at my yard sale, you guys and unsuspecting kids will get some freebies. Trading, I don't do much of as in the past I lost out BIG TIME on some moves (not to mention I am a card hoarder) but I do trade with a couple of REALLY TRUSTWORTHY individuals online and that's enough for me. What I am trying to say is, despite the decline in the hobby around me, I have put a positive twist on this and have found there are many other outlets to try and keep it going for myself and recommend if you are in the same boat, to try these as well. I know from experience it has worked for me. Also after reading this, you may ask me, why do I think the hobby has declined so much around me (possibly you as well) and my simple answer would be, hard to tell. Probably the same reason it has overall, we live in a technological age where there are ton of flashy things to get into. 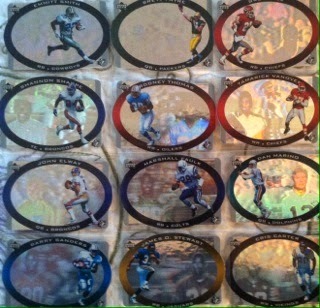 For example, when I think flashy things I think a sweet refractor card, but most now-a-days are thinking a PS4, a new iPhone, Xbox, iPad, or some other device. Like I said, a much different time. So to answer my overall question in the title of this post I would say yes, I think the hobby has declined but I don't think it's leaving anytime soon. There are still a lot of us long-time collectors and I see a few newbies join everyday. However, if this dying off trend keeps happening to others like it did to me in the next 20 years,ask me this question again then and my answer may be different. Which ones are your favorites? Do you take bloggers advice on cards and thoughts on the hobby? Out of the blogs you like, what is your main reason for liking it or them? What do you look for in a card blog? Week 3 June Contest Winner! Check Out This View From The Skybox Contest! That 90's Mail Day: 40 Card Pickup!